Free US Shipping on Orders $100 or More! Our shop hometown is Naples, New York. Here, grapes are king (and queen) of the fall season! Naples Grapeseed Foot Scrub (vegan) polishes and smooths and moisturizes tired feet and hands. 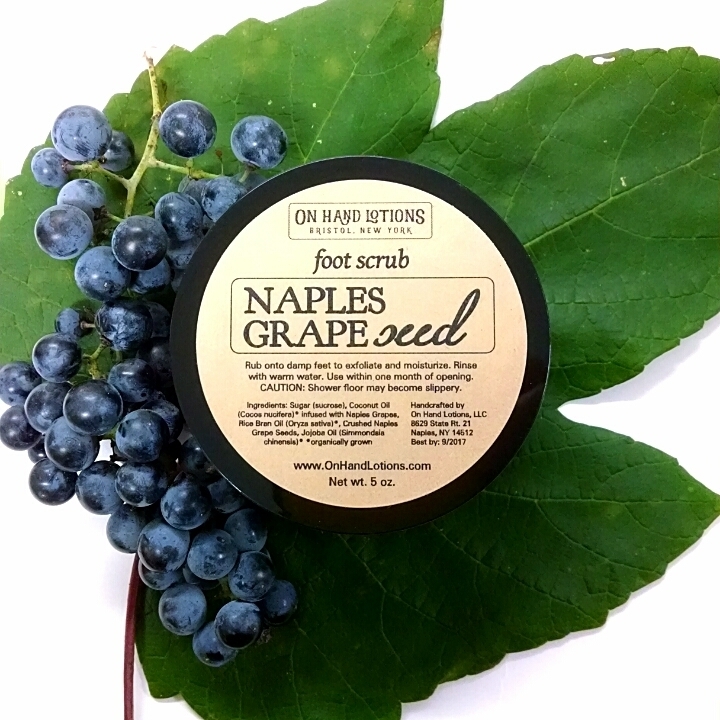 We wash, dry, and grind whole grape seeds from Naples grapes and blend them with grape-infused oils and sugar for a lightly scented, all natural scrub. Naples Grapeseed Foot Scrub will be available for a limited time! As always, our products are free of synthetic fragrances, flavorings, colorants, and preservatives. Please use caution when using sugar scrub in the shower, especially with children, as it may cause the floor to become a bit slippery. Join the On Hand Lotions mailing list!